Church of Ag. Adrianos, near Nauplion. A visit to the Nauplion area early this month allowed me the provisional identification of a few more. I have not worked out a satisfactory set of criteria for identification: in most cases I find rebuilding has obliterated architectural distinctions I would have expected, and in one case I have the before-and-after photographs that would prove it. Take Ag. Thomas at Midea about which I have written. Here you see the north end of the cross-vault in 1978, looking through to the arched south windows. I marked on the photograph the cross made with 8 or so inserted bowls, such as are found on Ag. Triada at Merbaka. I was unable to tell if the bowls were still in position and only whitewashed. Now the south side with its 8 or so bowls. 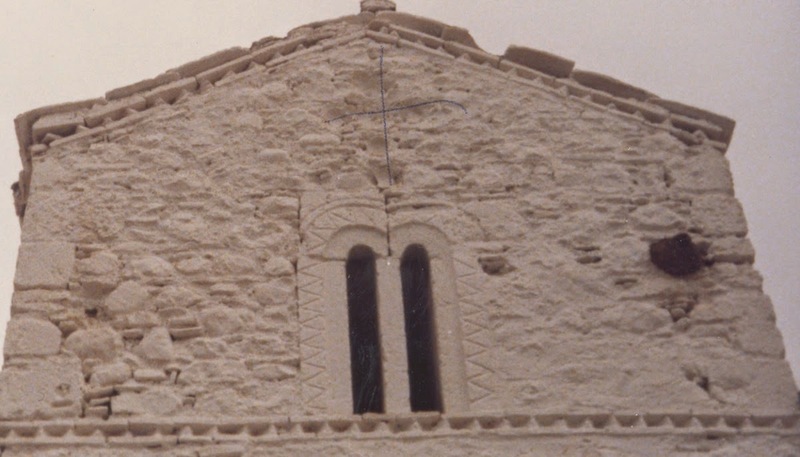 The bowls are characteristic of Frankish churches, though the church would have been built by Greek labor and we see this in the arches and dentil ornamentation. 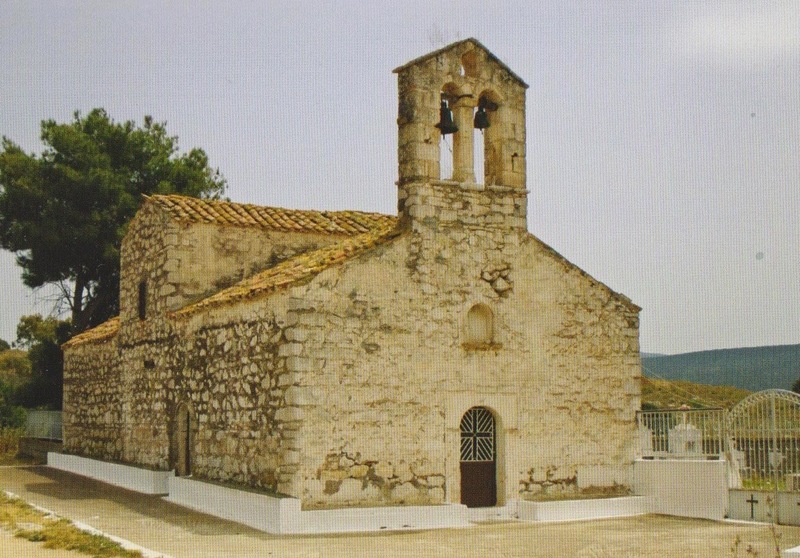 This little 13th-century church is perched on a small hill that looks across the plains from Midea to Nauplion. It would be unrecognizable as the same building were it not for my photographs. Another identification as a fief chapel is the presence of Western frescos, and I have written about the two I found here. One is at Ag. 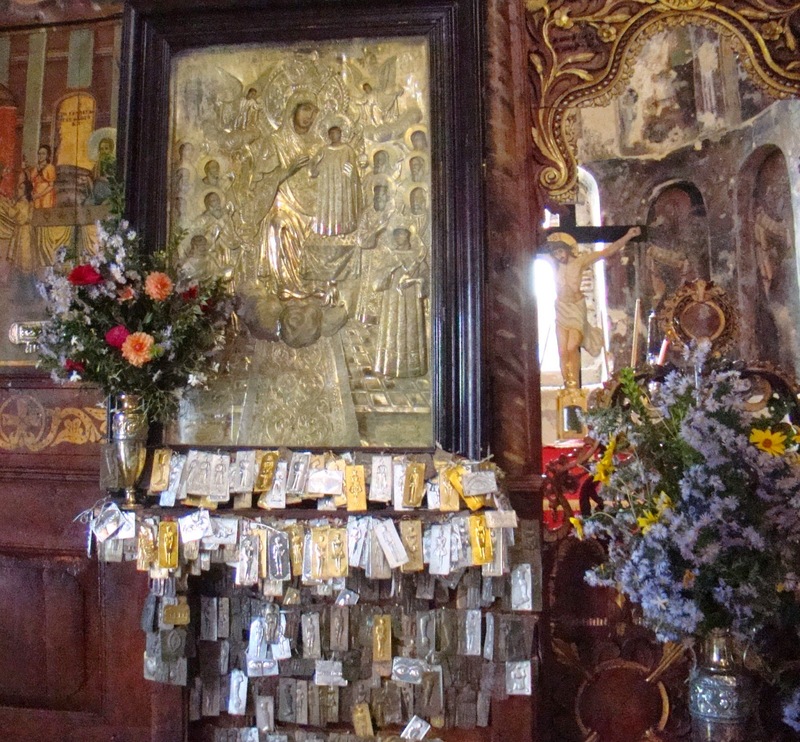 Marina at Kazarma, an endearingly clumsy chapel with a 14th-century fresco behind the iconostasis of a man in red and a woman in white. Rear view of Ag. Marina, Kazarma. and then at Ag. Sotira where far up to the right when you first enter is the remains of a fresco with Westerners looking up to a Franciscan-style cross. The fief of this church has been through a number of incarnations, and I suspect perhaps a little piracy might have been involved, given its private landing beach. Roof of Ag. Sotira, Asine. I reported these frescos to the Archaeological Service in 08-09, but nothing has been done towards their study or preservation. Nor has anything been done for the fortified tower at Ag. Sotira which was 4 stories high in 1978, but is now down to 3 stories. A church need not have been built by Franks or Venetians to have become a fief church, though I suspect there was very little pre-emption of religious space in terms of fiefs. 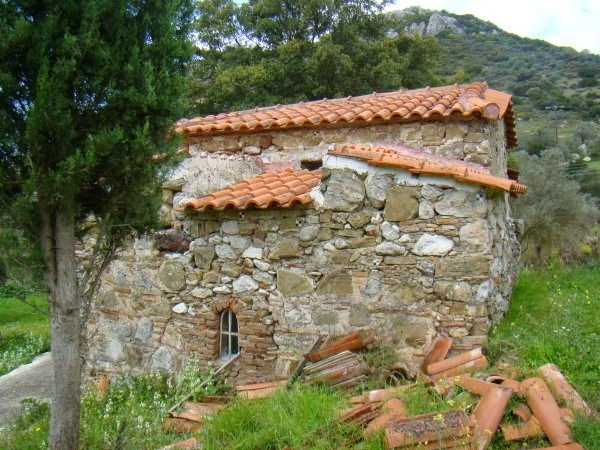 As an example, here is the tiny church at Plataniti from about 1100, I Metamorphosis, and then the newer clumsily-Western-built church a stone's throw away. I wasn't able to stand where I could get a complete shot of the facade of I Koimisi, but I did get one of its two surviving bowls. I think the church at the top of this entry, Ag. Adrianos, was built as a fief church, although it has been so improved and restored and rebuilt and hedged and locked against visitors, that it is difficult to say. These are the only two pictures I was able to get because of the barricades. It was, however, the church on the fief where Cyriaco went in the previous entry to find his Mycenae. A fresco in it gives a restoration date of 1713, and it is mentioned in a Venetian document of 1696. My interest is more in the earlier fiefs, but fiefs were assigned again when the Venetians came in 1686. Another church documented then, and in 1500 is Ag. Paraskevi on the side of the road up Palamidi. It, too, has been restored almost beyond recognition and given new bright frescos although I think it is distinctively Western-built. It was, once, a Santa Veneranda, being out in the area where the Albanians were living, though I think it was built well before they arrived. 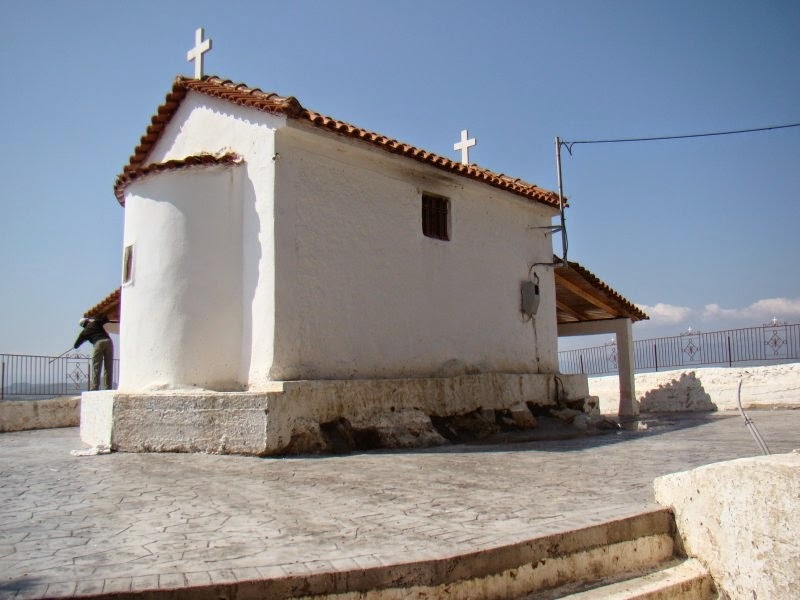 We have a 1500 reference to the Strada S. Veneranda, which was the road from Nauplion out to the side of Palamidi and over the hill to Karathona beach. As a final church, Ag. 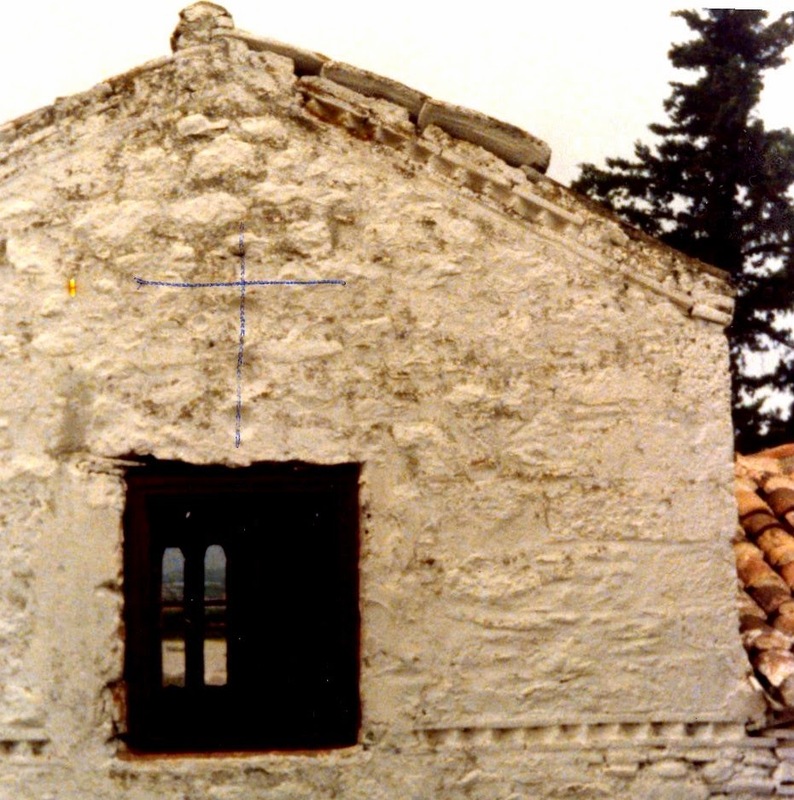 Nikolaos at Iria, near the coast, and also in an area that became Albanian. It has the date of 1381 carved over the western entrance. There are certainly more churches in the Argolid to identify and I may have been reckless about some of these. I can only hope for the opportunity of another visit. Meanwhile, I would be grateful for more information and corrections from readers. Cyriaco's Mycenae, at Ag. Adrianos near Nauplion, 2 November 2014. Nearly three years ago I wrote about Cyriaco's visit to what he thought was Mycenae, to a small, elegant fortification near Nauplion. At the time I inquired of various discussion lists “What did Mycenae mean in the Renaissance?” That question was too general and no response was ever offered, but a couple of weeks ago in Athens, Stella Chrysochoou, a scholar of cartography, brought up the topic from another angle. She has found, in Plethon's copy of Ptolemy, annotations of the "modern" -- fifteenth-century -- names of Greek cities. For examples, Mt. Taygetos is Pentadaktylon, Stymphalos is Zaraka, Sikyon is Vasilika, and Kleonai and Nauplia are "the same". Mycenae, however, Plethon had identified as "Polyphengos". Had he been there or did someone offer him the identification? Polyphengos is actually to the NW of Mycenae, near Nemea. Cyriaco's Mycenae is in the opposite direction, SE at Ag. Adrianos. This means that at least two different sets of Cylopean stones were identified as Mycenae, neither of them accurately, and makes one wonder what was visible at Mycenae when Cyriaco was shown Ag. Adrianos in 1448. 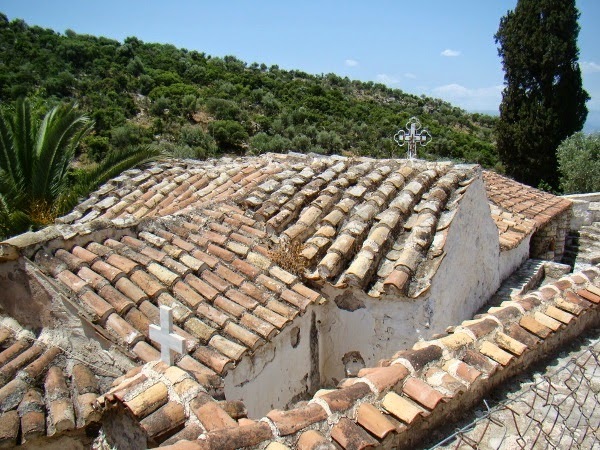 Why did Cyriaco care about Mycenae? He doesn't say. Before Mycenae, Cyriaco had been in Mistra with Plethon between August 1447 and April 1448 for at least two extensive visits, as well as exploring Mani. He had with him a newly commissioned copy of Strabo which he had had received in Constantinople on 26 January. Mycenae is to be found in Strabo 8.6.10 and Cyriaco was visiting in the general neighborhood. Strabo gives Mycenae a page of attention, after Argos, and after mentioning the statues of Polykleitos at the Heraion. Cyriaco was extremely enthusiastic about his discoveries of those very statues from the Heraion in the walls of a church. But what did his Venetian friends in Nauplion, Pietro Rangano the scribe, and Joannes Bendramon, know about Mycenae? Did Cyriaco pique their interest with his Strabo? Of the three places Strabo mentioned in the immediate area -- Argos, Mycenae, the Heraion -- Cyriaco did not go to Argos. Anyone from Nauplion would have told him that there was nothing there worthy of consideration. But if he had known Plethon's identification of Mycenae, wouldn't he have gone there? He doesn't mention Polyphengos. He never hesitated to travel several more days if he thought he might see something interesting. Homer himself was not much interested in Mycenae, barely mentioning it in the Iliad as one of a cluster of cities under Agamemnon in the Catalog of Ships, and in the Odyssey as a place ruled by Aigisthos after he killed Atreides. It is Argos in the Agamemnon that gets the full benefit of the spectacular deaths. It seems that Plethon and Cyriaco were more interested in Greek geography than in Greek literature and that is probably where Mycenae took on a little importance in the early Renaissance -- as one of a list of classical place names.